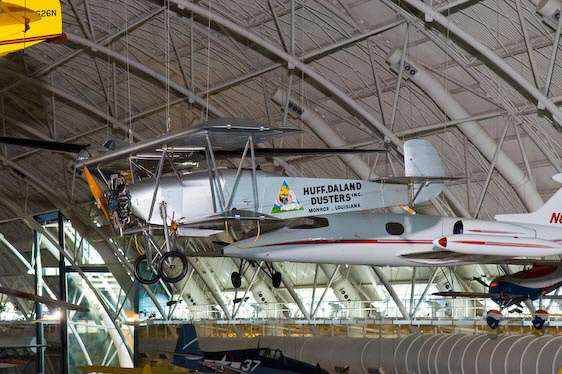 The Huff-Daland Duster was designed in 1925 for a new method of controlling agricultural insect pests, aerial crop dusting. 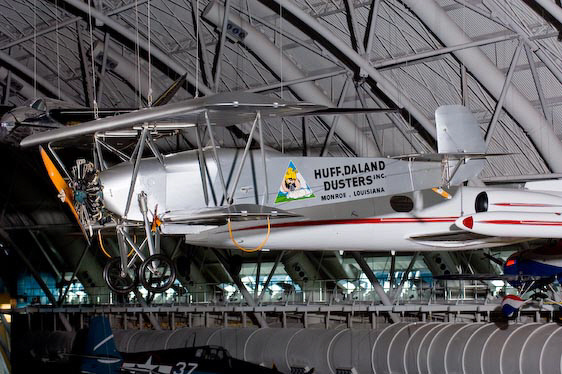 The Huff-Daland Manufacturing Company modified its sturdy Petrel military biplane with a large hopper for chemicals and spraying equipment and established the nation's first aerial dusting business, Huff-Daland Duster Company of Macon, Georgia and later, Monroe, Louisiana. C.E. Woolman took over the company in 1928 and renamed it Delta Air Service (forerunner of Delta Air Lines) to reflect the addition of mail and passenger service in Travel Airs. The remains of two of the original 18 Dusters stayed in storage until 1967 when Delta Air Lines selected one of them for restoration. Its registration number is unknown. 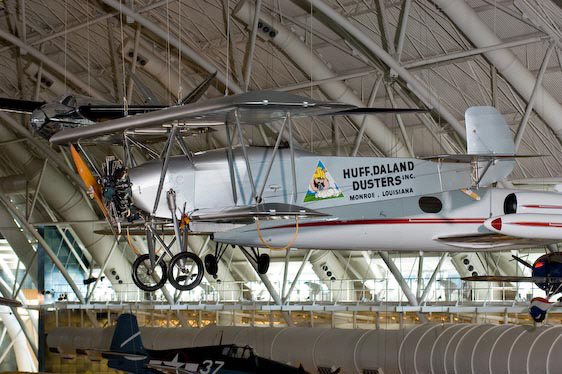 The Museum's Huff-Daland Duster is one of eighteen airplanes that were specifically designed by Huff-Daland to perform aerial crop dusting. In addition, the Huff-Daland Duster was the first aircraft to be used by the forerunner of the international airline Delta Air Lines. Dr. B.R. Coad, a government entomologist, conceived the idea that dusting the cotton industry's nemesis, the boll weevil, would be more efficient if it could be done from the air rather than from mule-drawn wagons. 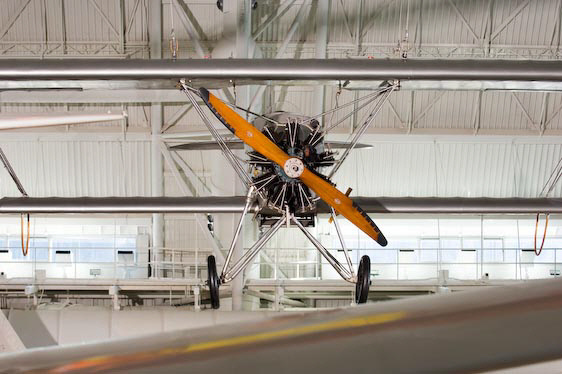 Initial trials with Curtiss Jenny biplanes convinced him that researchers were on the right track, but also highlighted the need for an aircraft specially designed for crop dusting. 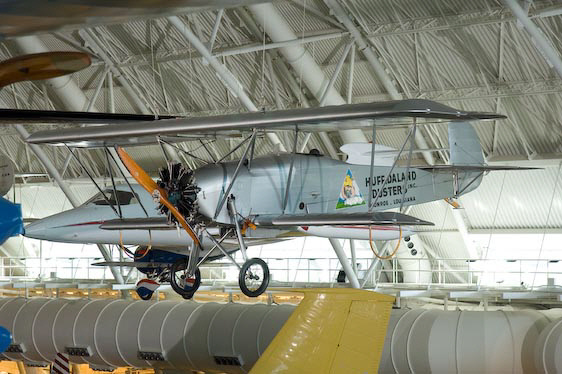 The Huff-Daland Manufacturing Company of Ogdensburg, New York received the contract to design and produce the Duster biplane which was completed in 1925. It was a derivative of a Huff-Daland military/commercial design, called the Petrel 5, which was used by the U.S. Navy both in landplane and seaplane versions. Fairchild Aerial Survey Company also used it for aerial photography. 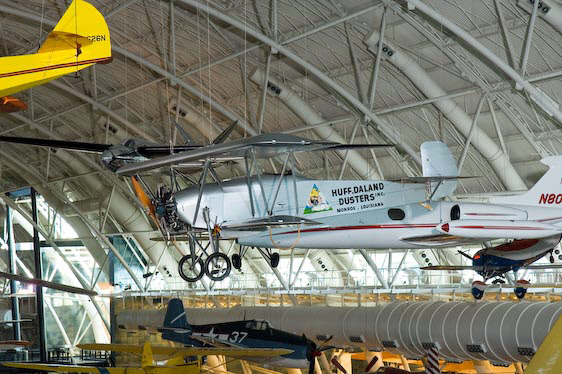 The Huff-Daland Duster was a fabric-covered, cantilever-winged biplane that was structurally designed so that it had none of the wing brace wires that were common of the biplane designs of that era. The fuselage and tail surfaces were made of welded steel tubing and the wings were single-piece units made of spruce and mahogany. The entire airplane, except for the area behind the engine, was fabric covered. The wing struts and landing gear were made of streamlined steel tubing. The landing gear was a conventional double-tripod split-axle type with 26x4 wire wheels and used Oleo struts for absorbing the landing loads. The dust hopper carried 800 pounds of calcium arsenate. Although some documentation says the Petrel 5's 200 hp Wright J-4 Whirlwind air-cooled 9-cylinder radial was replaced with a 400 hp Liberty 12 engine for the Duster, Delta officials said that their Dusters flew with the J-4B. In 1923, C .E. Woolman, an agricultural engineer and research assistant with the U.S. Department of Agriculture, joined the Huff-Daland Duster Company, located in Macon, Georgia, a subsidiary of Huff-Daland Manufacturing and the first company devoted to dusting operations. Three years later the Huff-Daland Duster Company relocated to Monroe, Louisiana. 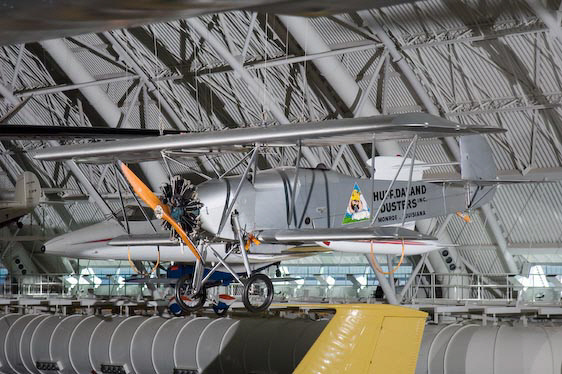 Because of the seasonal nature of the crop dusting business, Woolman began to operate in Peru in 1926 during the North American off-season, dusting more than 50,000 acres in Peruvian valleys in 1927. He expanded their business during 1928 by carrying passengers and freight in a Fairchild FC-2 and other aircraft, in association with Peruvian Airways Corporation, however the chronically unstable South American political climate caused him to abandon crop dusting and sell out this portion of the air service business. Woolman returned to the U.S. in 1928 and found the Huff-Daland Duster Company in financial difficulty. Huff-Daland Airplanes, then part of Keystone Aircraft, wanted to divest itself of Huff-Daland Duster so Woolman took it over, and, with the help of some Monroe investors, founded a new company, Delta Air Service, headquartered there. Woolman became senior Vice President and General Manager and planned to carry passengers and freight as well as continuing in the crop dusting business. They inaugurated their passenger and mail service with a route between Dallas and Jackson, Mississippi, flying six-passenger Travel Air 6000s. Thus began what was eventually to become Delta Air Lines. Woolman became president of Delta in 1945 and was appointed Chairman of the Board in 1965. The Dusters remained in service as dusters until they were replaced by Stearman C3Bs. Two original Huff-Daland Dusters were stored for many years at Monroe, but in 1963, they were removed from storage and brought to Delta's facilities in Atlanta, Georgia. Beginning in 1967, parts of one of the airplanes were restored to original condition by volunteer Delta Air Line personnel as a tribute to their founder C. E. Woolman. Although the fourteen original aircraft registration numbers are recorded, it was not possible to determine this particular aircraft's identity. A Wright Whirlwind J4B engine from the Museum's collection was installed on the aircraft along with a propeller. In a formal ceremony on January 18, 1968, Delta dignitaries officially donated the airplane to NASM. It was displayed in the Smithsonian's Arts and Industries Building for about six months before being earmarked for storage. The airplane was subsequently loaned back to Delta Airlines in the late 1970s for display in their own museum in Atlanta, Georgia. 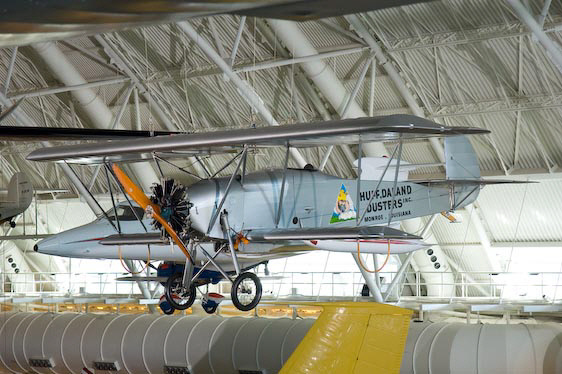 The airplane was temporarily displayed at the Louisiana World Exhibition from May to November 1984 and then was again temporarily relocated during 1997 at the Cincinnati/Northern Kentucky International Airport for their 50th Anniversary celebration. It then returned to Delta's Museum in Atlanta before finally being returned to NASM for display at the Stephen F. Udvar-Hazy Center at Dulles Airport in Chantilly, Virginia. Steel tube fuselage with wood wings, all fabric covered, biplane.